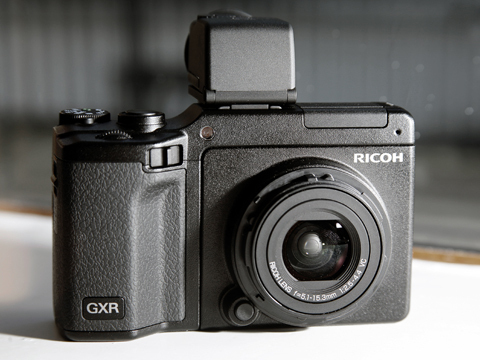 See here for AP’s earlier Ricoh GXR camera news article. Life is full of surprises but some are more surprising than others. We had known for some time that Ricoh was planning a new system as we’d been questioning the life out of the engineers at every opportunity. 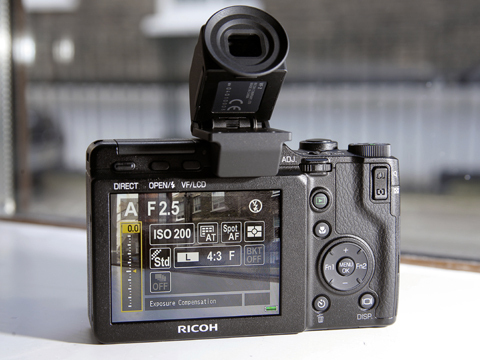 Since accepting that there was not going to be a Ricoh DSLR we could see the frustration, as well as the pent-up potential, as the company’s existence switched to the realms of the high-end specialist compact. Ricoh’s reputation for high-quality optics was in the balance, not because there were no high-quality optics, but because the brand was seriously in danger of slipping away behind the host of other manufacturers also catering for the demanding photographer. 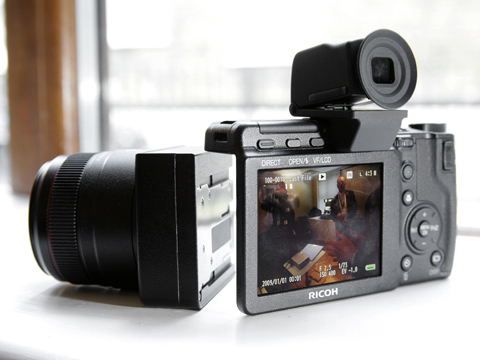 To reassert itself Ricoh needed to do something drastic, and I had expected a system not unlike Micro Four Thirds but using APS-C sensors. In my mind I could clearly see a digital version of the Contax G system, with Ricoh’s name on the top-plate. The GXR system is going to be a fascinating one but it is important I think not to judge it purely on what has been launched today. What we can see is just the beginning and each of the products – the body, the red-ringed GX lens unit and Ricoh unit – should be thought of as the first steps on three separate roads. At first I couldn’t rationalise the idea of having both APS-C and compact sensors in my bag, as I know I would always be drawn to the larger of the two and feel I was compromising if I switched to the compact unit. This would then bias the way I choose my focal lengths when out shooting, and could lead me to pick inappropriate optics for the sake of the pixel count. After some questioning though it became clear that there will be two lens ranges that will run in parallel and which may include the same focal lengths/ranges but with a choice of sensors behind them. In effect we’d have an entry range and a more advanced range. I should think too that there will be a range of bodies to match and that they will not all conform to the compact style form factor of this first model. 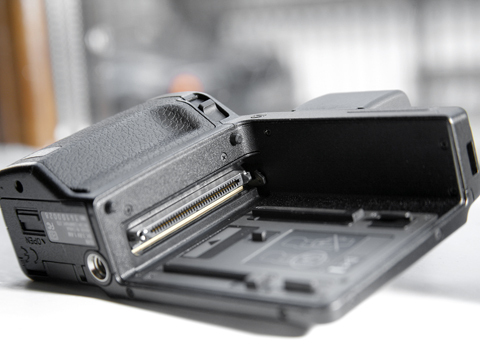 I know I’m not alone in preferring an EVF that’s built-in and which frees the hotshoe for flash units. I don’t think Ricoh will ignore that for long. We should be careful not to assume that what we see now represents a full picture of what the whole system will look like. I was lucky enough to be allowed a short time to try the new system, though I should stress that all the products I used were very much pre-production models. With the S10 unit attached the camera feels and acts much like a GX model, but with the larger A12 unit there is quite a different feel. I’m not certain 50mm on an APS-C sensor is general purpose but since using the Leica APO-Summicron-M 75mm f/2 ASPH on the M8 a few years ago I’ve become slightly hooked on the 75mm perspective and use standard fixed lenses on APS-C DSLRs quite a lot. It is a nice length for not-too-close portraits and for street scenes, but Ricoh may have some trouble convincing everyone of its benefits. Either way, it is not the most obvious focal length to introduce a system, especially from a company that is has been known for its provision of quality wideangle optics. It is an easy option though considering the difficulties that must have been encountered using an APS-C sensor and that very short back focus distance. Susumu Katagiri, Ricoh?s products manager, tells us that there are no shifted micro lenses on this sensor ? the method Kodak uses to solve Leica?s short back focus problems ? so all the work to avoid darkening at the edge of the image is shared by the lens construction and processing firmware. A more general-purpose wideangle lens would be much more difficult to deal with. There is a new quick menu button that brings up the most-often changed settings, which really speeds up access and reduces the time spent looking at the camera rather than at the subject. With the viewfinder plugged in the menus show at eye-level instead of on the camera?s rear LCD. Although I haven?t had the chance to test the viewfinder in a wide range of conditions it does seem to be an improvement on EVFs we have seen in the past. I suspect the technology announcements from Epson in the past few weeks are closely related to the development of this finder. It has a high level of clarity and seems to avoid the colour drag we see in other EVFs that use LED technology. There are some flashing colours around static objects ? such as menu items – when you blink, but I didn?t notice the effect around elements of the subject. It wouldn?t be fair to draw any conclusions from the captured images, but I suppose it is logical to assume image quality will not go backwards between now and the camera?s launch. If that is the case, I think we will be generally pleased with what the camera produces. I didn?t recognise the characteristics of the APS-C CMOS sensor, but the 1/1.7 compact CCD displays qualities that suggest it is similar to the sensor used in Canon?s Powershot G11. The camera system is in itself interesting enough, but the potential for add-on elements and more developments make GXR very exciting. There is no lens mount obviously, but on questioning Mr Kazunobu Saiki, general manager for Ricoh?s global camera division, seemed to acknowledge that a sensor unit fitted with a mount receptive to M and L rangefinder lenses would be a positive addition to the system. Those with good memories will recall that Ricoh had the 28mm f/2.8 and 21mm f/3.5 lenses from its film GR series of compact cameras launched as limited-edition screw-thread L models many years ago. I don?t suppose the possibility of making its new system directly attractive to Leica and Voigtländer users has passed the company by. Neither Saiki nor Katagiri would be drawn on when this type of unit might become available, but in previous talks Saiki has agreed that an important element in the success of the Micro Four Thirds system is its ability to tap into existing lens systems via adapters. This type of strategy ensures a new system does not require a complete reinvestment for photographer to take it up. There will be more lens/sensor units released in the second quarter of 2010. Saiki spent some time demonstrating that there is potential for the camera body to be used to host units other than those containing lenses and sensors. 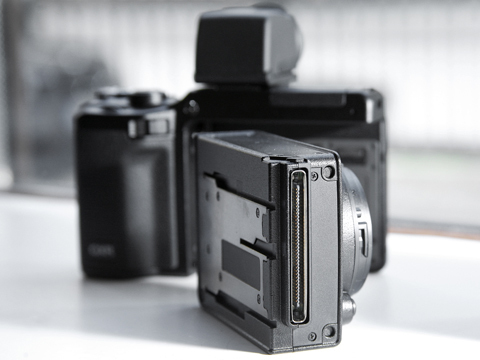 The slot in the body could be used to mount a storage device, for example, to transfer image files from a memory card and even to view them on a larger screen. The connectors could also be used to send images to a slot-in projector unit, or a mini printer, among any number of other add-ons. 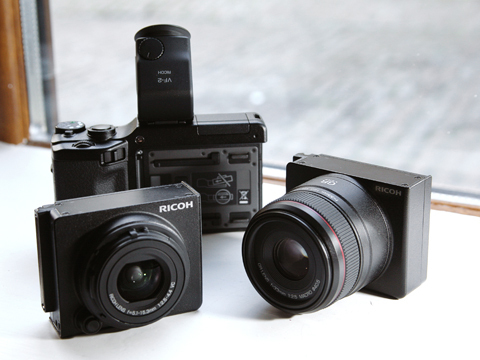 The GXR modular system is an extremely interesting idea and it really is full of potential. We?ll have to wait and see how it pans out. I suspect though the success of the system as a whole will depend quite heavily on how Ricoh goes about explaining it and also on how accessible and desirable the system is made early on by the order in which products are launched. The company needs to put the aspiration element into the minds of users at the earliest opportunity, to ensure that the initial desire is met by a credible range of options that will satisfy at least the general needs of demanding photographers. Fantastic as GXR is, the AP reader will probably like a little more encouragement to invest in such a new system.